When you have higher-order multiples, you gain a kind of instant celebrity status. People stop you everywhere and ask questions or make comments ... some are very, very stupid, and some that are genuine and very kind. It's been hard to miss us, really. 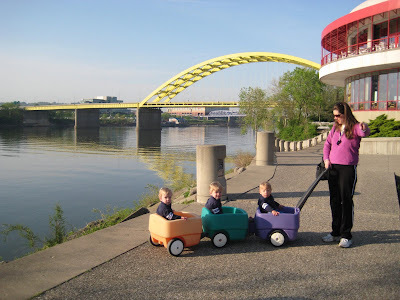 When the boys were younger, we had a monstrous triple stroller. Now we have the 3-car (sometimes 4-car) choo-choo wagon. And, I guess it doesn't help that I dress the boys the same or in coordinating outfits. Honestly, the reasons I do that is not to draw attention, but because (1) it is the easiest way to shop -- 2T blue, done! ; and (2) it is easy to spot them in a crowded play area when they all are dressed the same. As the boys are getting old enough to be able to walk in parking lots holding hands, sit in shopping carts, etc, we have been able to venture out without a clown car type mode of transportation. And I have found that we aren't the center of attention anymore. The other day we were shopping at Sam's Club -- I had two boys in my cart and Dan had one in his. A lady was passing me in the bakery section, when she stopped and said, "Twins?" I felt this pang of disappointment, and before I could stop myself I said, "No. Triplets! The other one is around the corner with Daddy." The lady was one of the polite ones and mumbled a "Good Luck" or something civil as she carted off. I was left stuck to my spot. 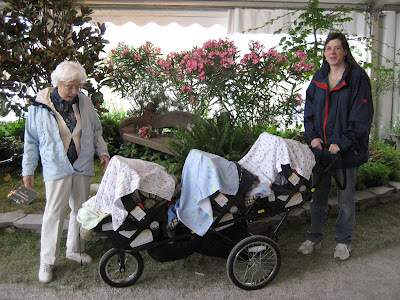 After all of my complaining and crying about how we are always accosted anywhere we go because we had triplets, here I was grumbling about not being hounded about having triplets. Even going so far as to proclaim we had triplets. I think I became used to the attention ... came to expect it. And with it fading, I feel like a castaway reality TV star. 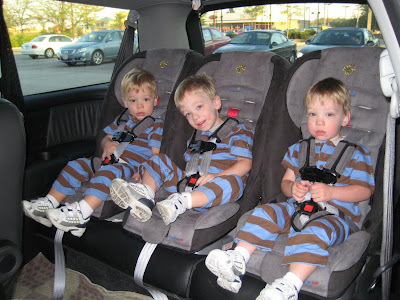 I wonder if they'll make a show called "I'm a Triplet Mom! Get Me Out of Here!". Great post - I know exactly what you mean! I left Jules with Grandma one day and had just Sam & Sophie. When someone said, "how old are your twins?" I couldn't stop my self and said how they were triplets, bla bla bla. Too funny!